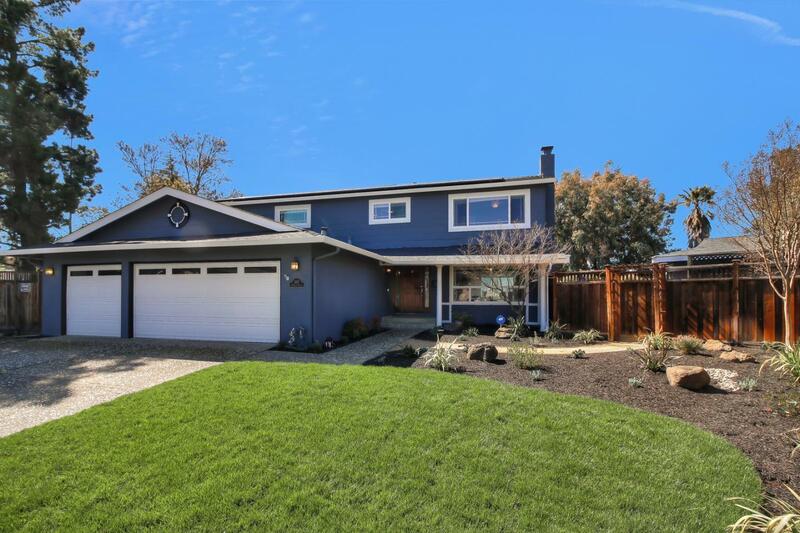 Located on a premier end of court pie-lot, this meticulously renovated 4 bed, 2.5 bath, 2,629 SF home boasts views of the Pleasanton foothills. An entertainer dream kitchen with quartz countertops, Thermador appliances, farmhouse apron-style sink, custom wood cabinetry, and beverage fridge is the perfect place for family and friends to gather. The master bedroom retreat features a newly remodeled 5-piece master bathroom, walk-in closet, sitting area, and private balcony. A built-in speaker system can be heard in the kitchen, living room and outdoor areas, are wired for central control, and include a Sonos system. In addition to these upgrades, the home includes owned solar, new HVAC unit; dual zone HVAC controls with Nest controllers, wired-in Ring video doorbell system, whole house fan, ADT security system, custom window coverings downstairs, covered outdoor patio with built-in lighting / fan, pebble-tec pool with removable safety gate, separate hot-tub, and a gas outdoor fireplace.